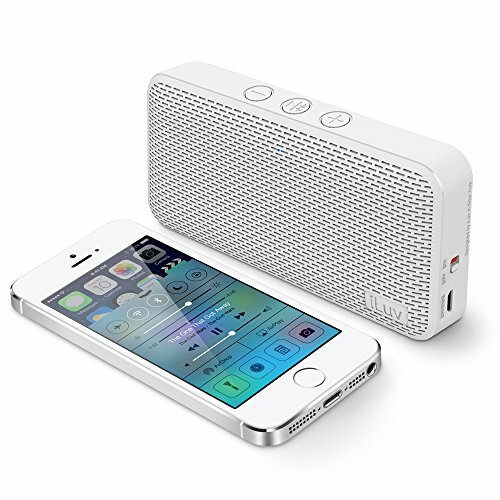 iLuv Aud Mini Ultra Slim Pocket-Sized Powerful Sound Bluetooth Speaker for iPhone, iPad, Samsung GALAXY Series, Note, Tablet, LG, Google Android phone, other Bluetooth Devices and Echo Dot(White) by iLuv at DJ Luu. MPN: AUDMINI3WH. Hurry! Limited time offer. Offer valid only while supplies last. INTENSE Sound Effects from Something so Small- Although Aud Mini is one of the smallest speakers in the market it is also one of the most effective. INTENSE Sound Effects from Something so Small- Although Aud Mini is one of the smallest speakers in the market it is also one of the most effective. Something so small packs a great deal of punch. With its passive radiator capable of delivering big, full-rang sounds that everyone can enjoy. Ride Into The Groove Any Where you Go!-With this portable speaker moving to the groove anywhere is possible. Just turn it on and amp it up to the party started! Attach this to your backpack and get the party moving Take it anywhere the just start up the fun. Get Your Moneys Worth- When our customers pay for our product we always want them to be happy! One way to happiness is music. With the Aud mini you won't regret ever buying it because it is so simple and great. ADORABLY MINI & PORTABLE: Anyone want to carry a Jukebox? Not us! With the Aud Mini speaker it is so much easier to carry around. And trust our reviews! the speaker gives off really big and dynamic sounds and is super amazing! The size is the same as the iPhone 6, but of course it is lightweight and something many college students or music lovers would love! This speaker even comes with a chain. Just attach it to your backpack and it will never come off! Have fun with music. THE AMAZING BLUETOOTH DAYS- These days bluetooth is the IT THING! Who doesn't use bluetooth. Along as being such an amazing speaker with great loud sound quality it is bluetooth! Easy to use and always pairs after the first pairing! You don't ever have re-pair them again. Bluetooth is super easy to use and if in case a situation doesn't allow we have a back up, we have an aux plug in. GREAT! THE AMAZING QUALITY OF THE SPEAKER- From the small speaker such an amazing bass and such great sound quality comes from something small. Small size but Big sound. For something as light and tiny it proves to show such amazing quality of this amazingly sophisticated speaker. Great quality, Great sound and Great design. Who wouldn't love it?! DESGIN- The Ultra Slim Aud Mini allows anyone to carry it around with ease and to just bring it on the go. Since it is so compact and it is the size of the iPhone 6 you can just slip it right into your pocket and just bring it with you, just make sure you don't confuse it for your phone.